Midwest Bay Isle Collection | Bay Isle Dog Crates for Dogs 11 - 90lbs. The Midwest Bay Isle Collection is a great looking solution for the discerning pet owner. This is a wire, drop pin crate that assembles easily. The rattan look panels are attached to the wire panels making assembly a snap. 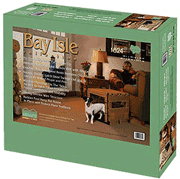 Bay Isle features rubber feet to keep the pet home in place and protect floor surfaces. Look after your valuable floors! Bay Isle collection features openings in the sides as well as the back panel, providing your pet ventilation and visibility. Attractive rattan / wicker finish with square pattern accent weave blends well with any décor. Get Your Bay Isle Dog Crate Today! Now your pet can be at home in your home! The Bay Isle crate can be placed anywhere in your home because it blends so well with your decor. Truly designed for the discerning home owner, the Bay Isle dog crate is great for your pet and your home! This model has been discontinued and has no direct replacement. Bay Isle Replacement Pans are still available. If you are looking for a rattan, or wicker dog crate, but want a more durable product, the Midwest Bay Isle dog crate is for you. These dog crates look great and are ideal for the pet owner who wants a high quality, decorative dog crate. Midwest Bay Isle dog crates integrate well with your decor and look great in the home. Far more durable than a rattan, or wicker crate, the Midwest Bay Isle Collection is a good looking, versatile solution for the discerning pet owner. Need more help on sizing your crate? Click here for the Bay Isle size guide. Bay Isle dog crates provide the best of both worlds - the great look of a rattan / wicker dog crate but with the strength and durability of a wire mesh crate. The Bay Isle crate is strong, and unlike a rattan / wicker crate can withstand an active dog.